Apologies for the lack of recent posts! As consolation, it means that I'm maybe getting closer to finding my way to the end of my dissertation. Also, I've been writing for some other fine publications. (You can find some links here.) But I've got a ton of odd tidbits of knowledge too hairy and weird for my diss., but which are, to me, real darlings, laboriously distilled from archival sources in my bespoke scholarly alembic, and perfect blog-style aperitifs, so stay tuned. As some of you may know, I’ve been involved with MOFAD since before they opened their first exhibit — “Flavor: Making It and Faking It” — in Brooklyn last year. I was a historical advisor to that exhibit, helped develop some of the content, and gave a couple of talks. I had nothing at all to do with this new exhibit. But I recently had the chance to preview the plans with MOFAD director Peter Kim, and it’s really phenomenal. I think this is going to be a fantastic show, bigger and even better than “Flavor." “Chow” tells the story of Chinese-American food, beginning with the immigration of Chinese laborers in the 19th century to build the Western railroads and up through the present day. The exhibit considers both the people who made the food and also the people who ate it — the entangled histories of immigrants and consumers — and presents a nuanced and fascinating account of American cultural, political, and social change in the 20th century. Some of the historic menus that will be on view at MOFAD's new exhibit. Now, many of you are probably like, “sounds… educational." But what makes a food-focused museum so great, and so necessary, is that it can take all that stuff that pro and semi-pro historians get excited about, and make it meaningful and memorable and accessible to ordinary humans by relating it to common experience. The ubiquitous corner Chinese takeout place — seemingly incidental, often overlooked — becomes a place with a history, a place where the personal and the social, the cultural and the political and the economic, converge, inspiring questions, curiosity, dialogue. Not to put too fine a point on it, but this is the kind of experience that actually makes democratic society thrive. Also, the exhibit is going to be crazy fun. The MOFAD team has been working with a group of amazing scholars to develop content and programming, as well as a brilliant design team, and they have assembled an incredible array of artifacts to bring this story to life. 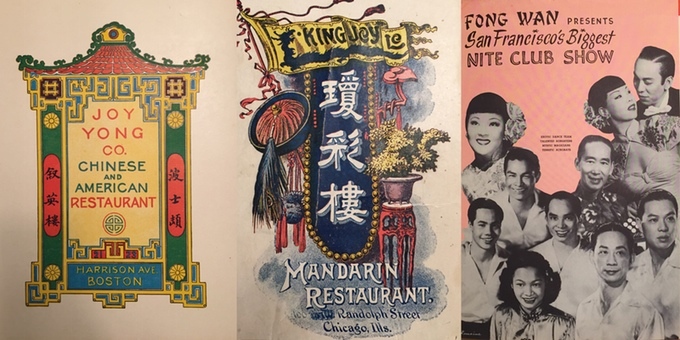 Some highlights: a timeline of historic Chinese restaurant menus, spanning more than a century, illustrating both how Chinese-American food changed and how US culture changed around it. In one corner of the exhibit hall, they are building a partial replica of Pekin Noodle House of Butte, Montana, the oldest continuously operating Chinese restaurant in the US. There are plans for a tasting station, where visitors can sample and compare what passed for chow mein in the 1890s and what that dish means in the present day. MOFAD does have foundation and city funding, but, barely past its first year in a physical location, it is still more or less a fledgling start-up, with a small and ultra-dedicated staff of super smart and creative people. They really could use your support to help make this thing happen. Thanks so much for reading, and much love!